Archaeological excavations in Israel and neighbouring countries reveal that, during the Hellenistic, Roman and Byzantine periods, Samaritan and Jewish communities sometimes lived alongside each other. This raises a question: how can we distinguish between the remains of Samaritan and Jewish synagogues? In my view, four distinct differences help to identify the remains of a synagogue, and hence the neighbourhood or village, as Jewish or Samaritan. These are: Orientation, Location, Style of Decoration and Age. Samaritan Synagogues face the Israelite Samaritans’ sole sacred place, Mount Gerizim. This holds true for all Samaritan synagogues, irrespective of where they were built. We can confirm this by examining Samaritan synagogues in Damascus, Cairo, Gaza, Salt, Beit Shean, Islands in the Reed Sea, Thessaloniki, Rome, Delos, Crete, Sicily, Haifa, Caesarea, Ramleh, Yavneh and elsewhere. Wherever we find them, the front of a Samaritan Synagogue faces Mount Gerizim. By contrast, Jewish Synagogues face Jerusalem. However, in some cases, the orientation of the Synagogue does not help identification. This is because Temple Mount in Jerusalem and Mount Gerizim in Samaria lie close to the same line of longitude. Mount Gerizim stands approximately 40 miles (64km) north of Temple Mount. Consequently, we have difficulty identifying Synagogues due south of Temple Mount or due north of Mount Gerizim, because there is hardly any difference in their orientation. In this case, synagogue location may be the most useful guide. When we find the synagogue outside the living area of the neighbourhood or village, it is likely to be Samaritan. In contrast, Jewish synagogues were typically built centrally, inside the neighbourhood or village. We can see the placement of Samaritan synagogues outside the living area at Chirbet Samara, Zur Nathan, El Chirbeh, Shechem (Nablus), the summit of Mount Gerizim, Thessaloniki, Sicily, and recently in Beit Shean. The practice arose from the commandment, obeyed by Samaritans, to build the place of worship beyond the camp living area. Antonius of Placentia, a Christian pilgrim who visited Samaritan villages in 579 CE, recorded that on the Sabbath the Samaritans dressed in white and went outside the village to pray at the synagogue, where a priest received visitors. The practice of building outside the neighbourhood continued into modern times. The 1927 earthquake in Nablus devastated many homes, including those of the Samaritans. Consequently, the Samaritans left Jasmine, their neighbourhood in the old city. A few years later, in 1933 they relocated to a new neighbourhood west of Nablus. They built a new synagogue beside this neighbourhood in 1947. 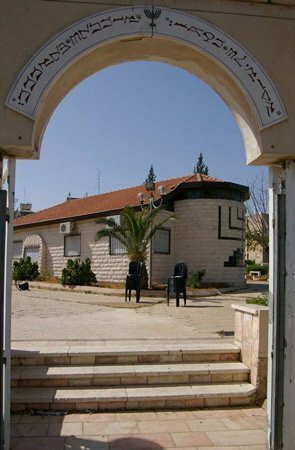 The Israelite Samaritans also established a population centre outside Nablus, in Holon, Israel, in 1955. There, between 1959 and 1963, they built their first synagogue in the State of Israel. Again, they sited their synagogue outside the neighbourhood. Later, the population grew, and limited space forced them to build new houses on three sides of the synagogue yard. When the Holon and Nablus communities built a common synagogue on Mount Gerizim in 1964, they built the synagogue outside the Kiriat Luza neighbourhood. Since then, the neighbourhood expanded and has come very close to the synagogue, again due to limited building space. 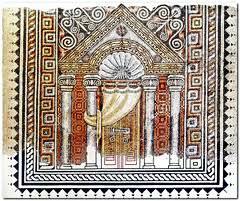 The third factor distinguishing between Jewish and Samaritan synagogues is the style of interior decoration, particularly in ground mosaics. 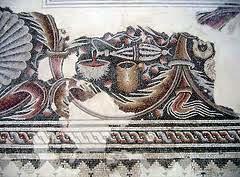 Influenced by foreign cultures, the Jews employed pagan symbols in some synagogue mosaics, for example, the Zodiac and the heads of impure animals, such as lions and tigers. In Samaritan synagogues, even the most complicated mosaics are free of pagan symbols. Samaritan artists were careful to use only symbols mentioned in the Torah. Thus, we find The Tabernacle utensils, particularly the Menorah (seven-branched candelabrum), the Shofar (ramshorn), trumpets. We also find the heads of pure birds and animals, such as doves, sheep and goats. Consequently, when viewed from ground level a Samaritan synagogue interior has a simple, modest appearance. In general, Samaritan synagogues were built much earlier than Jewish ones. Until 70 CE the Jews still had their Temple in Jerusalem. At this time the Israelite Samaritans had no central temple, since they considered the Temple of Moses the only true Temple ever consecrated. The oldest Samaritan evidence, for prayers and the style of singing poems and hymns in synagogues, dates from the Hellenistic period. Before that time the people probably assembled in public meeting places to pray, as they did each year on Mount Gerizim during Passover and the Pilgrimages. What are the Samaritan terms for “synagogue” and “temple”? Beth Knesset / Beth Mikdash as in Hebrew? There has never been a Beth Mikdash on Mount Gerizim. Do Samaritans eat Orthodox Jewish certified products or do Samaritans have their own certification?